» GAPS: How much is just right? GAPS: How much is just right? 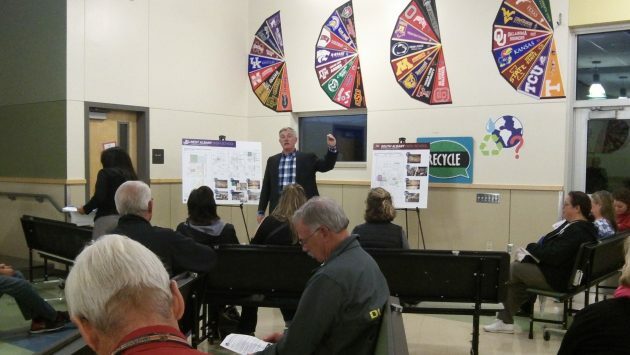 Superintendent Jim Golden thanks people for attending Wednesday’s listening session at Timber Ridge School. Would voters in the Greater Albany School District vote for a tax increase big enough to cover more than $200 million in school expansions, additions and renovations? Probably not. So district leaders are trying to guess the amount that is less but could possibly win approval in a bond election tentatively planned next May. About 20 members of the public — in addition to school board members and school district employees — showed up at Timber Ridge School Wednesday night for the first of four sessions this month to gather comments. Whether board members or Superintendent Jim Golden learned anything from the sparse crowd I don’t know. To get a firmer grasp on public sentiment, the district is planning a professional telephone survey this winter before making a decision on the amount and scope of the bond. One option is a bond that would require a property tax rate to merely replace, not increase, the about-to-expire tax rate levied to pay off the previous school construction and renovation bond. But that would probably pay for roughly half the projects the district has identified as being useful or needed. People attending the Wednesday session were handed a sheet outlining projects identified by a citizens’ advisory committee. The total: $208 million, based on architects’ preliminary estimates. Among the items on the list: New and bigger elementary schools at Clover Ridge and Oak Grove totaling $48 million. Replacing part of West Albany High School and adding a second gym totaling more than $34 million. Also, two additional phases of replacing the rest of West for $62.6 million. At South Albany, adding a $14.9 million auditorium and a second gymnasium for $5.8 million. 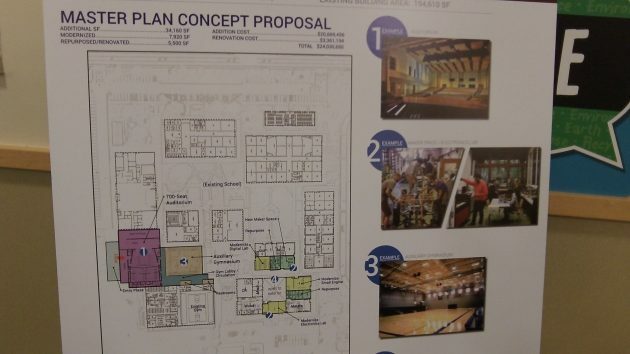 (A concept plan for West includes an auditorium as well, but the list didn’t mention it.) Topping the list were $39 million in facility upgrades. GAPS counted about 9,500 students this fall from kindergarten through high school, along with the full-time equivalent of nearly 1,100 teachers and other employees in 21 schools. Golden expects enrollment to keep growing. “We hired approximately 90 new teachers and assistants this year, our largest group ever,” he says in a newsletter. The district does not want to put up a bond issue so large that voters are likely to say no, one administrator told me. They’re looking for the sweet spot that will accomplish the most important improvements and also get at least one more than half the votes in the May special election. This concept for South Albany High shows a 700-seat auditorium (1) and an auxiliary gym (3). One thing I don’t miss about living in Albany is the never ending cycle of local bond measures that, by law, are supposed to be “temporary.” As one bond expires the local taxing districts always want another in replacement. Effectively, this form of manipulation transforms Oregon’s constitutionally limited property tax rates into something else – a heavier, virtually PERMANENT yoke around every taxpayer’s neck. The City of Albany does this; LBCC does this; and GAPS will attempt to do this. Every bond ADDs to a taxpayer’s constitutionally limited tax burden. Mr. Shadle is on to something here. We are constitutionally-protected so that we can proudly boast that Oregon, My Oregon, has one of the lowest High School graduation rates in the nation. In fact,the State Superintendent of Schools in Mississippi wakes up every morning thanking God for Oregon cause he looks good by comparison. God forbid that schools should be commodious enough to handle a burgeoning student population. God forbid that we should attempt to raise Oregon’s tragic status as a state filled with slow people. Attempting to improve would violate our constitutionally-protected right to be as moronic as we want to be. Yes, Mr. Shadle…the bond measures are nothing more than a noose round the necks of constitutionally-protected citizens who desire nothing more than to dwell at the margins of society because Johnny Can’t Read. With more people not in the work force in 40 years, with stagnant wages, stagnant growth, a flat economy and no where near 3-4% GDP, 45 million on food stamps, families on tight budgets….is this the time to be asking for more money at all. Depending on where you live, there are other upcoming bond measures as well. We are squeezed ! Especially those on fixed incomes….where are we to come up with 500, 1000 or $1,500.00 more on our property tax bills ? Government is always wanting more of our money. Re your paragraph 3 -“Useful or Needed” Lots of things can be useful’ but, they are not “Needed” or necessary. Why not just stick with what is needed? We have been paying property taxes into GAPS since 1960 and, according to a flier that came from GAPS today, have helped pay for 13 new schools in that time. I’m sure there are others that have done the same. Why can’t something be worked out with LBCC to use the Performing Art facility there instead of building two more that will only have limited use during the school year? Yes, who can afford this? The well-to-do and corporations are good examples. It may be time to reconsider M97 and scratch the yes oval with your pen. If Comcast, for example, raises rates because of this, just cut the cord. Guess what…they will raise rates regardless. I will only add that Oregon spends $10,500.00 a year or student. It has been shown time and time again that spending more money on education does not increase the educated, test scores or the graduation date. On measure 97; if passed, the funds are not dedicated and it is rumored that much of these funds will be used to prop up PERS pensions. Rumored? How trumpian! Won’t win any debate points with that.